We hope you know the difference between your Chemicals and your Consumables, otherwise you need to be watched closely. As far as the Notions go, most classification systems wind up with certain things of which there are not enough to make a separate group, or which defy classification. "Miscellaneous" doesn't seem to have a compelling ring to it. Who wants to read a catalog section called "miscellaneous"? Thus, our title. And besides, sometimes all you need is a great notion. 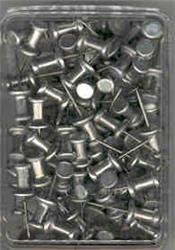 Flux is required for soldering to lead or copper foil. Whiting is used by the craftsman as a cleaning agent to help remove the residues from the work after the soldering operation. 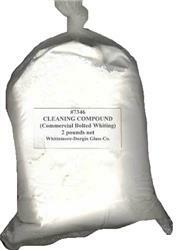 Whiting is one of the ingredients in polishing compounds, putties, paints, etc. This soft non-abrasive powder is usually applied with a stiff scrub brush. Its use is recommended particularly on copper foil shades to remove the flux and gum, and to give a high shine to the glass and metal. 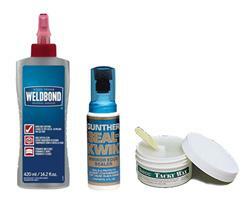 Use when cementing a leaded glass window or panel. 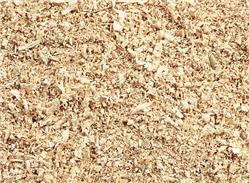 Some people use whiting, but we like the traditional sawdust. 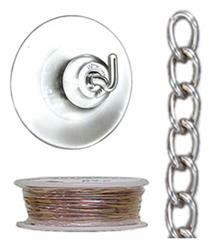 Chain, tinned copper wire, suction cups, chain, and other things to help you hang your stained glass creations. 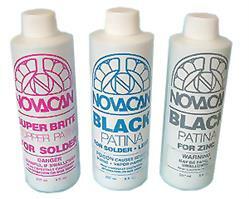 To keep your soldering iron clean and trouble-free.